Red Hen Press, 9781597096928, 214pp. 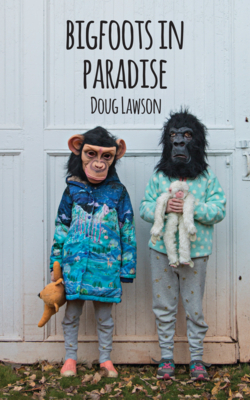 Beauty and terror collide in Doug Lawson's Bigfoots in Paradise, a wild new collection of stories set largely in and around Santa Cruz, California and the surrounding mountains. It's a land tucked between Silicon Valley and the Pacific Ocean, one that's populated by aging hippies and venture capitalist sharks, pot farmers and surfers, child prodigies and roaming herds of wild boar. Earthquakes rumble, meth labs explode, helicopters search overhead for drug farms while wildfires ravage the hillsides. Blimps crash, mushrooms dream, dogfights erupt, trustafarians pontificate while pneumatic ostriches walk the streets and sons and fathers and lovers try desperately to find some way to connect with the past, with themselves, before it's too late. Doug's prize-winning prose is as nimble and touching as it is lyric, and he plunges headlong into this astonishing country at a fine-tuned, white-knuckled pace that will leave you both gasping for breath and holding your heart in your hands. His characters are awkward, ungainly, and great at hiding and they shamble through the beautiful wilderness of their lives, searching for meaning, searching for themselves. - In The Mushroom Hunter, a young man goes to live with his once-violent childhood friend, the man's girlfriend and her son, just before the massive Loma Prieta earthquake strikes. They hunt mushrooms up and down the mountains as the mountains build up to the great quake, not realizing the danger they're all in from the quake, and from each other. - In Catch the Air, a blimp crashes into the ocean as a start-up company fails and a father and son struggle with the father's famous, failing mind. - In The Night Witches, a face out of her counter-cultural past causes a Santa Cruz mother to re-evaluate everything she's come to call her life. - In House on Bear Mountain, a woman inherits a vacation house in the Sierras from her dead husband, only to find her husband's family isn't quite ready to let it go yet. - In a modern take on Conrad's Heart of Darkness, The Beekeeper of Rio Momon sends a group of urban farmers on a misguided quest for one of their own, deep into the South American wilderness. - In Bigfoots in Paradise, a group of friends set out to film bigfoot in the Santa Cruz Mountains, only to discover there's a lot more bigfoot inside of each of them. Doug's stories stand out today for their verbal pyrotechnics, their dark humor and their emotional impact. His Santa Cruz stories tackle themes of parenthood, memory, class divide, self-indulgence, and adulthood in a way that leaves his characters' hearts bare, and their minds spinning, while as readers we can't imagine what could possibly happen next.